Straight Outta Compton is shaping up to be one of the most buzzed about films of the summer, but it wasn't always such smooth sailings for the N.W.A. biopic. One of the main challenges was casting the roles of Ice Cube, Dr Dre, DJ Yella, MC Ren and Eazy-E, the five founding members of N.W.A. Cube and Dre are both credited as producers on Straight Outta Compton, as is Eazy-E's widow, Tomica Woods-Wright, while Yella and Ren acted as consultants, but it's unclear who exactly had any say in the casting of the film, and there's been a fair share of controversy. So how does N.W.A. feel about Straight Outta Compton , then? Ice Cube and Dr. Dre seem to be in approval, for the most part. As producers, they had more influence than Yella and Ren, but they have both remained adamant that they did not have final say, and tried hard to silence any allegations of nepotism after Ice Cube's son, O'Shea Jackson Jr., was cast to play his father in the film. Jackson actually did have to audition for the part, and worked steadily with acting coaches for two years before he was officially cast in the film. "He had to earn it," director F. Gary Gray told the Los Angeles Daily News. "I'm not going to put my career in the hands of a novice just for nepotism. These guys didn't bring me on for that. They brought me on to serve the story and tell the history of NWA, and I'm here to make the hard choices. So, when Shea's name came up at first, it was interesting, but it was certainly a longshot. But he did the work, over two years, and I auditioned hundreds of people along the way." Ice Cube wasn't the only member of N.W.A. who had a son that wanted to take part in the film. It was previously reported that Eazy-E's eldest son, rapper Lil Eazy-E, auditioned for the film, as did Dr Dre's son Curtis. 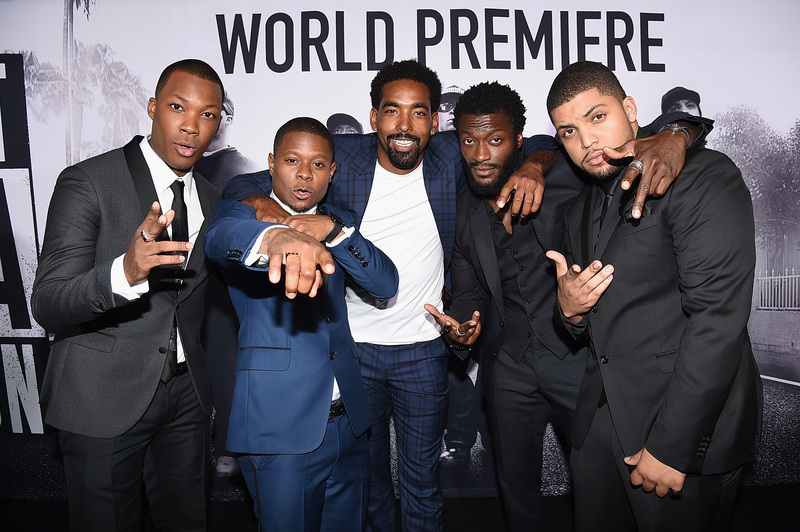 Both failed to book the part, and the roles ended up going to Juilliard-trained Corey Hawkins, who plays Dre, and Jason Mitchell, as Eazy-E. Rounding out the cast are Neil Brown Jr. as DJ Yella and Aldis Hodge as MC Ren, all found after a nationwide open casting call. After the casting, rumors emerged that Lil Eazy-E resented not getting to play his father in the film, but the rapper denied any reports of conflict, and even revealed that he invited Mitchell into his childhood home so that he could learn more about Eazy-E. "I reached out to him to give him the support and any advice he needs. He has a big burden on his shoulders to bring forth the character and legacy of my father and the legacy of N.W.A., period," Lil Eazy-E told Rolling Stone. MC Ren and DJ Yella didn't seem to have any problems with the actors cast to play their younger selves. It was only later, when the trailer for Straight Outta Compton was released, that MC Ren voiced any disapproval of the film. The NWA star was angry that his character didn't appear in the trailer, which made it seem as though MC Ren might barely appear in the movie itself despite playing a large role in the group's history. Despite the drama caused by that first trailer, MC Ren appears to have let go of his previous anger, and has been supporting the film alongside Ice Cube and Dr Dre during this summer's promotional tour. The drama may have died down for now, but after Straight Outta Compton is released on Friday, Aug. 14, there's no telling what reactions the subjects of the film might have.